STEPWISE is a project executed within the European H2020 LCE program. It has received funding from the European Union’s Horizon 2020 research and innovation programme under grant agreement No. 640769. The project aims at the demonstration of advanced pre-combustion CO2 removal technology within the framework of the Iron and Steel industry, aiming at lowering the CO2 footprint of steel production. Blast Furnace Gas is decarbonized and then intended for power production. The CO2 removal is performed with an advanced CO2 removal technology making use of regenerative solid adsorbents. The technology combines the conversion of the carbon monoxide into CO2 and H2 by reacting it with steam via the Water-gas shift reaction, with the adsorption of the CO2 on a selective solid adsorbent at elevated temperature. This produces a hot H2-rich stream at pressure, suitable for power production. Regeneration of the solid adsorbent by means of pressure swing results in a CO2-rich product, suitable for transport and storage. 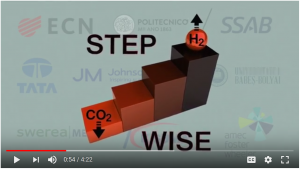 In the Stepwise project, this process is demonstrated at a scale of 14 t/day CO2 removal. The STEPWISE project represents the essential demonstration step within the research, development and demonstration trajectory of the Sorption Enhanced Water-Gas Shift technology (SEWGS). This project will further reduce the risks associated with scaling up of the technology. See our Promotional Video of the STEPWISE project and the SEWGS technology.